Abstract - Foldable ultralight electric vehicles (E-ULV) with a range of 4-5 kilometers and a weight of 5-7 kilograms are a promising key component for future sustainable traffic chains in urban regions with mountainous topography. While E-Bikes are hard to use in the rush-hour of metropolitan public transport, these – actually not available and not legally usable – E-ULV are a real innovation for the “last mile”. This paper presents electric drive add-on kits for foldable scooters that can be used on public walkways, train stations and subway platforms. 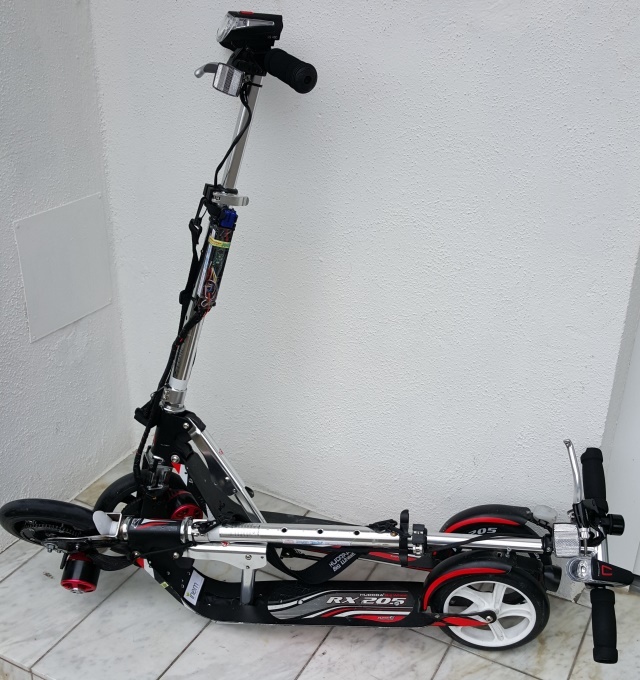 The key innovation of these very light, slow and powerful foldable scooters is the adaptive speed limitation based on ultrasonic sensors, that limits the maximum velocity to 6 km/h on crowded walkways and permits a faster movement up to 10 km/h if the walkway is obstacle-free. The E-ULV had been tested legally by fleets with up to 50 vehicles on public walkways in Stuttgart and Esslingen by special permission of the Ministry for Traffic and Infrastructure Baden-Württemberg. The fleet test proved a significant modal split shift towards public transportation with halved car kilometers. In Germany, a promising alternative to electrified scooters are ultralight electrical power assisted folding bicycles – actually not available below 12 kg – where a legal vehicle category exists in the whole European Union. All investigated E-ULV turned out shift car kilometers to the public transport system effectively as well as they avoid parking lot search traffic. Keywords: Urban walkway traffic, Personal light vehicle, Electrical assistance. Foldable scooters and bicycles are well known for decades (see figure 1 and figure 9). In flat metropolitan regions like Berlin, Hamburg or Cologne a light foldable vehicle is often used instead of walking or using a bicycle between the apartment or working place, the tramway or train station. In mountainous metropolitan regions like Zürich or Stuttgart, vehicles without additional power assistance are exhausting on longer climbs. Long downhill distances are a real challenge for foldable scooters. The typical rear wheel friction brake is effective for emergency stops as well as for short slopes. On longer slopes the friction power leads to a melting shoe sole. 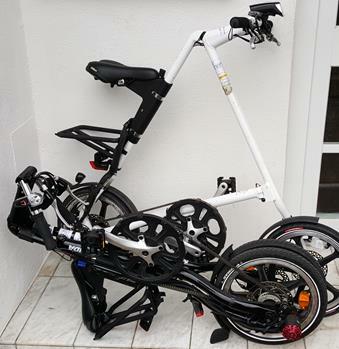 Although few electrical power assisted folding bikes (so called folding-PEDELEC’s) are available on the marked, these bikes are quite heavy (>>12 kg), extremely expensive or of questionable quality. Moreover, all premium folding bike manufacturers have withdrawn their electrified versions in the last few years. Electrified folding scooters are available from Asian manufacturers (cheap and heavy) and latterly from Switzerland (lightweight and expensive) – all together much to fast (up to 25 km/h) and with no legal admission for middle European public roads or walkways. The Esslingen and Stuttgart Universities of Applied Sciences research cooperation “TrottiElec” (trottinette electrifié) developed an electric drive add-on kit for lightweight slow folding scooters with high gradability on public walkways (see chapter 2). Furthermore, the research cooperation obtained the support of the Ministry for Traffic and Infrastructure Baden-Württemberg (MVI-BW) for a temporary legal test fleet and developed a Smartphone-App (see chapter 3) to find out the shift of the modal split due to these new key elements. The main objective of this fleet experiment is the scientific sustainability and acceptance proof for E-ULV to initiate a suitable vehicle category in middle Europe (see chapters 4 and 5). Folding scooters (figure 1) without power assistance are considered as toys and are tolerated by the German traffic authorities on public walkways. Their usage on public streets however is prohibited. Electrified scooters are power-driven vehicles and thus not allowed on walkways with the exception of handicapped aids (third wheel, seat, handicapped ID). Electrified scooters for public street usage require a type approval as well as a vehicle category. The type approval is actually only achievable for bicycle-like scooters (heavy and large). A vehicle category does not exist at the moment although there are efforts on European Union level to introduce a “Personal Light Electric Vehicle (PLEV)”-category for the street . Figure 1. Electrified folding scooters (ca. 250€/1,3kg additional cost/weight). Figure 2 shows the front wheel add-on kit that fulfills the above mentioned preconditions [2,3]. 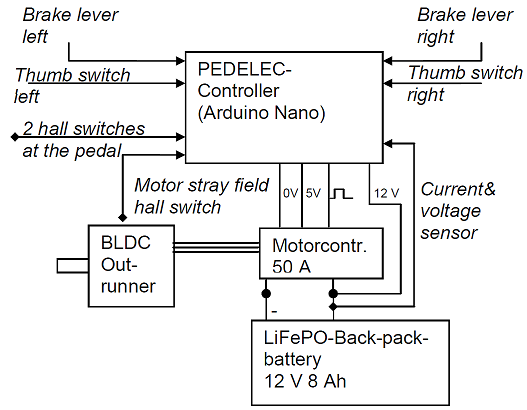 The BLDC-outrunner motor and the BLDC-power electronics are controlled by a microcontroller. The user input (thumb switch and brake lever) is transposed into the vehicle characteristic diagram shown in Figure 3. Figure 2. 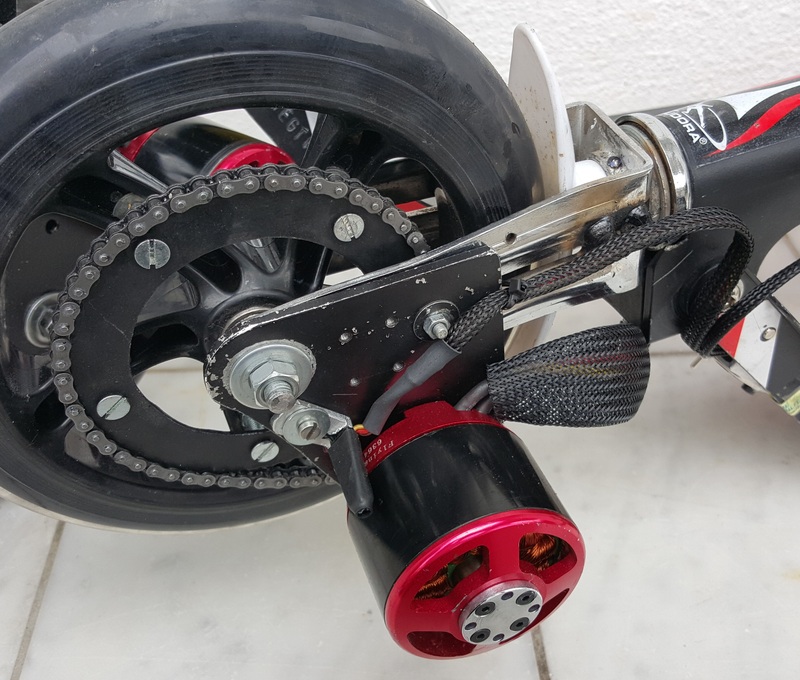 Electrified folding scooter front wheel add-on kit. Velocity and acceleration are measured by a hall switch in the stray magnetic field of the outrunner. The software kick sensor enables the electric assistance if a minimum acceleration is detected and holds this enable status for several seconds. The start-up lockup requires a certain minimum velocity to prevent misuse or mechanical injuries at the driven front wheel. All drive and brake set points are low-pass filtered for a smooth assistance/brake performance. Figure 3. Electrified folding scooter add-on kit vehicle characteristic diagram. 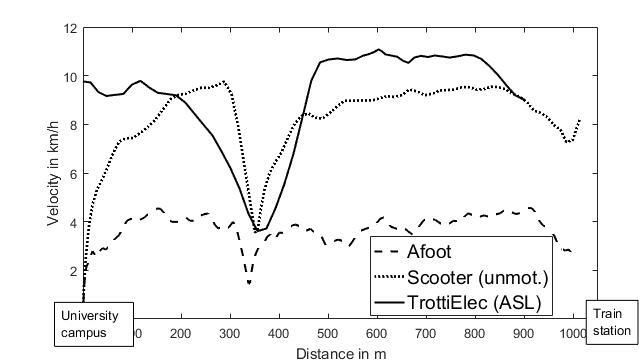 The challenging TrottiElec test cycle in Figure 4 shows that the 40 Wh LiFePO-battery in the scooter bottom ensures a range of about 2 km (i.e. one mile) even for high ascents (about 10 %) with tolerable motor heating. For this worst case load cycle, the human power input was restricted to the necessary kicks to keep the electrical power assistance active (one kick every 8-10 seconds). The range turned out to be more or less independent from outside temperature or weather conditions. Charging time is up to 1.5 hours. The Technical Supervisory Association (TÜV-Süd, Munich/Pforzheim) inspected the first prototypes and confirmed their conformity to the MVI-BW obligations (certificate no. 6230462318). Based on this certificate, the local traffic authorities in Esslingen and Stuttgart support a 2-year fleet experiment on public walkways until 2018. The first fleet with 25 TrottiElecs, non-motorised folding scooters and a pedestrian comparison group started in autumn 2016. The enlarged fleet test with 72 vehicles and pedestrians started in spring 2017. To collect the modal split and the traffic chain data (position, velocity, selected vehicles, weather conditions) a Smartphone-App has been developed by the Fraunhofer-IAO-KEIM applied research group, to make the fleet test data recording more efficient and reliable. Figure 4. Heavy load cycle for the TrottiElec. The “Mobility Recognizer” is an advanced electronical travel diary, which allows users to collect sensor data automatically during their trips. Once enough sensor data has been collected, the Mobility Recognizer can determine the user’s transportation mode automatically, by carrying the smartphone in the pocket or rather at the body. At the end of the trip, the proband can validate the trip data and initiates an upload to the university server (or discards the journey). Following a far-reaching analysis of mobility data across various categories, a machine learning process was developed that assimilates the typical characteristics of collected sensor data for each mode of transport. Automatic transportation mode detection has significant benefits in comparison to conventional travel diaries and questionnaires. It can increase the automation of analyses, which in turn can be less time consuming. The alternative paper questionnaires are usually completed out after the trip from memory, which can cause inaccurate data. Table 1. Modal split of the fleet test. Compared to the actual situation (pedestrian way for the last mile) where the car is dominating the modal split, the unmotorised scooter for the last mile shifts the modal split towards train, tram and bus. We expect this effect to be more significant in cities with flat topography. In the mountaineous Stuttgart region tested here, the TrottiElecs reach the best modal split for the public transportation system. Thus, electrified folding ultralight vehicles can halve the car utilization. The first fleet experiments in 2016 and 2017 made clear that the fixed 6 km/h speed limit makes the TrottiElecs not attractive enough compared to the unmotorised scooters due to the missing traveling time advantage on the last mile. In contrast, the unlimited scooter that runs up to 12 km/h has been quite more attractive for our probands. 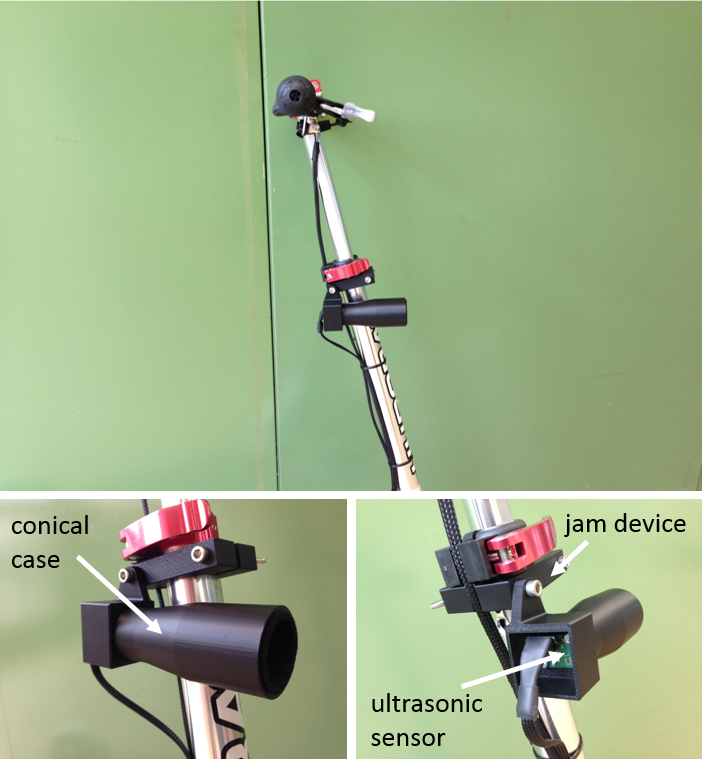 To ensure a small relative velocity to the pedestrian traffic participants, we developed an ultrasonic-sensor-based adaptive speed limitation (ASL – see figure 5) that limits the electrical assistance to 6 km/h if obstacles are detected within 4 m range. 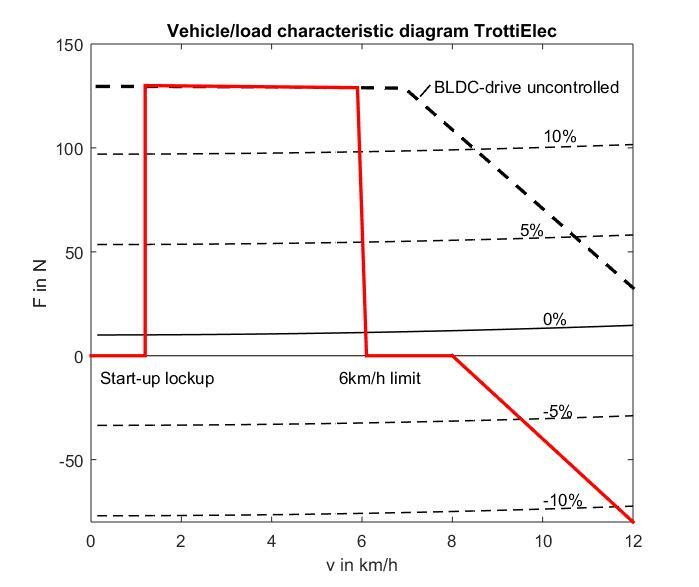 If no obstacle is detected, the TrottiElec reaches between 10 and 12 km/h (uncontrolled drive characteristic diagram in figure 3). 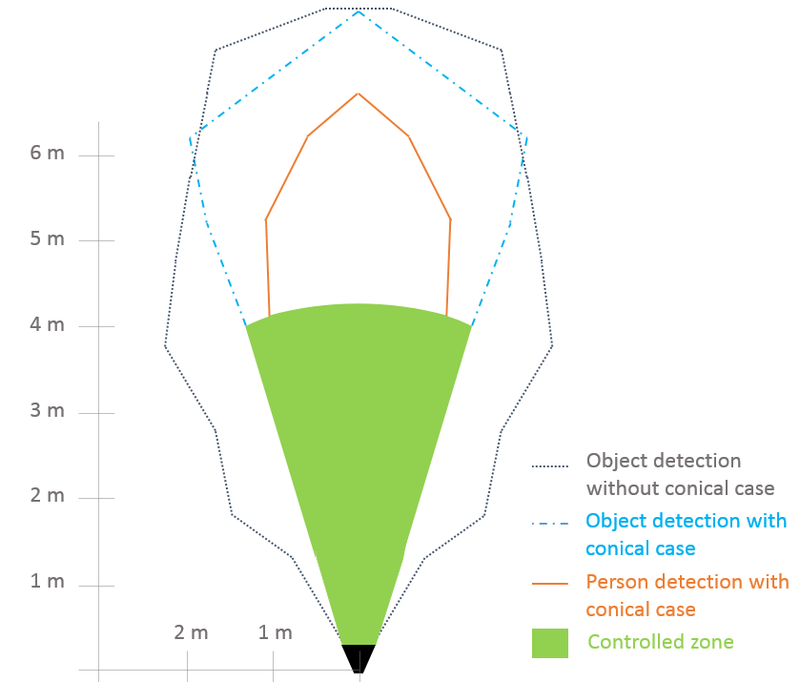 Figure 6 shows the different detection zones of the ultrasonic sensor with and without conical case that has big influence on the laterally width of the detection zone. The dotted border-line in Figure 7 indicates the limit of object detection without any adapted case. Figure 5. Adaptive Speed Limitation based on ultra-sonic sensors. Figure 6. Detection zones of the ultrasonic sensor with and without conical case. The lateral width of this detection zone is more than 2 m and thus will prevent driving in a parallel manner to house walls. The blue and the orange lines show slimmer areas of detection due to the conical case. The controlled zone finally is described by the green area. The maximum controlled lateral distance to an obstacle is 1,20 m. If the scooter is faster than 6 km/h and if the ultrasonic distance sensor detects an obstacle in this 4m-area, the motor will change to idle run and the scooter reduces speed. When driving on a narrow path the scooter reduces the electrical assistance too. 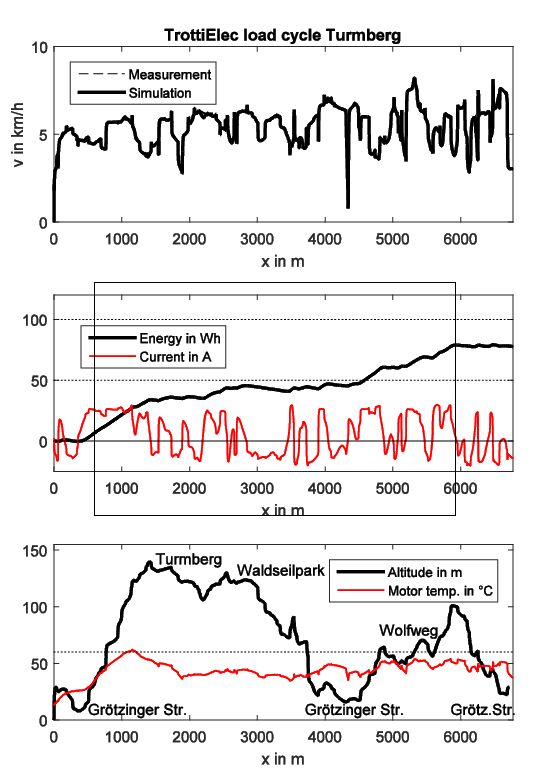 Figure 7 shows the velocity comparison between the three proband groups in the first fleet experiment by example of the 1-km-distance between university campus and train station. The travelling time afoot is about 15 minutes (without perspiration), the unmotorised scooters require 6 minutes (with significant perspiration on that distance) and the TrottiElecs are slightly faster (5:30 minutes without perspiration). The ASL works well as this can be seen in Figure 8 at the 350m-distance where the trip crosses the crowded pedestrian zone, while the walkway on the other trip segments is more or less obstacle free. Figure 7. Exemplary comparision of electrified scooters with ASL and unmotorised scooters on a typical last mile distance (here Esslingen train station to university campus). This example shows that the TrottiElec with ASL combines both, safety and traffic advantages as well as perspiration free micro-mobility. Thus, slow electrified foldable scooters could be tolerated on walkways as the unmotorised folding scooters are tolerated today. This would be the smallest threshold for a future product. After several months of negotiations between the TrottiElec research cooperation and the Ministry of Traffic and Infrastructure Baden-Württemberg, the permission for walkways has been rejected for TrottiElec’s with electrical power assistance faster than 6 km/h. Thus, the local traffic authorities will not permit a legal usage of ASL-TrottiElec’s on public walkways in the mid-term perspective. Regrettably, based on these discussions, we do not expect a legal vehicle category for electric folding scooters on walkways in the near future in Germany. As long as the usage of attractive Last-Mile-E-ULV is legally prohibited and depends on the tolerance (or the overload) of the local police, the electrified folding scooter cannot be recommended for honest and law-abiding urban commuters. Since most of the pedestrian zones in the Stuttgart metropolitan area meanwhile are opened for bicycles, the folding bicycle is the only candidate for a legal Last-Mile(s)-key-element in sustainable traffic chains. The folding bike “STRIDA” (see figure 8) was developed in the 1980’s in the UK but had very poor commercial success in Europe. Since this bicycle is manufactured in Taiwan and had been advertised as low-carbon fashionable life-style product for urban commuters, sales numbers are rising significantly in Asia and latterly in Europe. Figure 8. Electrified folding bikes. Foldable in a few seconds, Strida is the lightest bike (about 9.8 kg), that can be used with adequate comfort for a distance of 2-10 km. Its idiosyncratic steering dynamics can be adapted easily and with 18-inch pneumatic tires, even farm tracks and cobblestone roads are trafficable. Recently, the manufacturer has presented an electrified version of the Strida. It’s a pity that this - obviously cost driven - E-bike is as heavy as the other foldable E-bikes on the market. Therefore we adapted the TrottiElec drive chain for the rear axis, as elucidated in Figure 9 and Table 2, with a drive control software according to the EN 15194 (EPAC – Electrical Power Assisted Cycle), a pedaling hall sensor, a 25 km/h velocity limit for electrical power assistance as well as two thumb switches to scale the power assistance and two brake lever switches to scale the recuperative brake force (see Figure 10). The vehicle characteristic diagram is given in Figure 12. Due to the electrical force assistance of about 80 N, this one-gear bike can be used in the challenging topography of Stuttgart and Esslingen for ascents up to 12 % without perspiration. Figure 9. Rear wheel BLDC-Outrunner chain drive. Figure 10. Hardware-Setup of the BLDC-Outrunner chain drive add-on kit. Table 2. 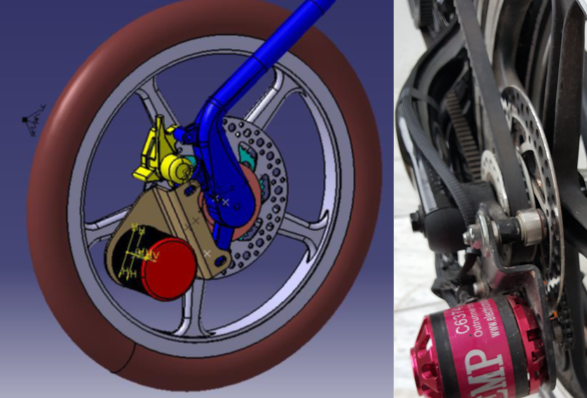 EPAC-Strida add-on kit components. Figure 11. Vehicle and load characteristic diagram with 25 km/h speed limitation. The 100Wh-LiFePO-battery (about 1 kg) is placed in the backpack. The electrified bike now weights about 11.5 kg and can be handled as easy as the original Strida on stairs, tram station platforms, escalators and lifts. In spring 2017, we electrified the first carbon fibre version (Strida-C1) available in Europe and reached a bike weight below 10 kg – the lightest electrified folding bike in the world. The folded bike fits into the baggage nets of trains or under the passenger seat of tramways and busses. The small prototype fleet of 6 EPAC’s had been examined successfully by the technical supervisory association (TÜV Süd certificate no. 6230462320) and now operates reliable in the Stuttgart region – with a remarkable publicity – for more than two years. The human power input requirements are elucidated in Figure 12 by example of a very challenging 10 km load cycle with long ascending sections. Here, the driver has to add 100-150 Watts for periods of up to one minute that is under the perspiration limit of a trained cyclist . 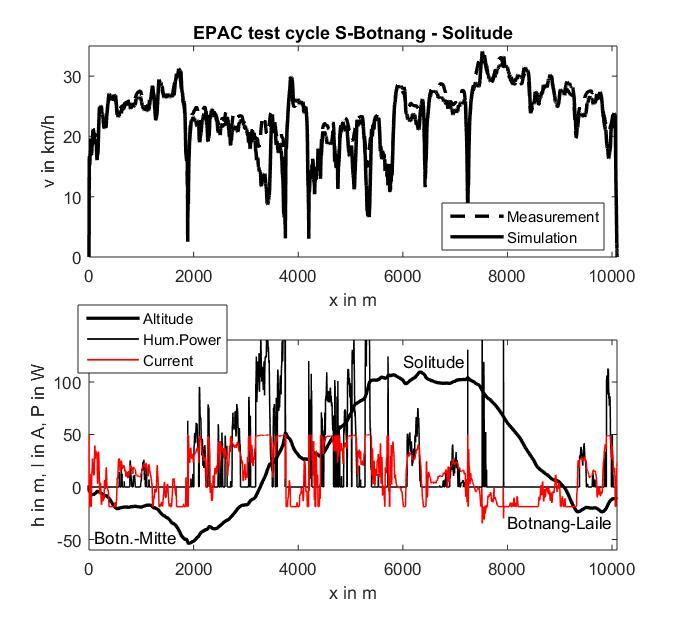 Nevertheless, several probands have judged this test cycle as upper limit for the usability of the EPAC-Strida. Thus the 10 km range in Figure 12 can be considered as worst case. Figure 12 also shows the battery current along the load cycle. Although the electric regenerative braking sections are quite visible, the recuperation gain for additional range is comparatively small. If the braking current is not limited to 20 A – that would severely damage the battery – the additional range is less than 15 % for all examined load cycles. The 20 A limitation reduces the range gain to 5-10 % depending on the load cycle topography. Figure 12. 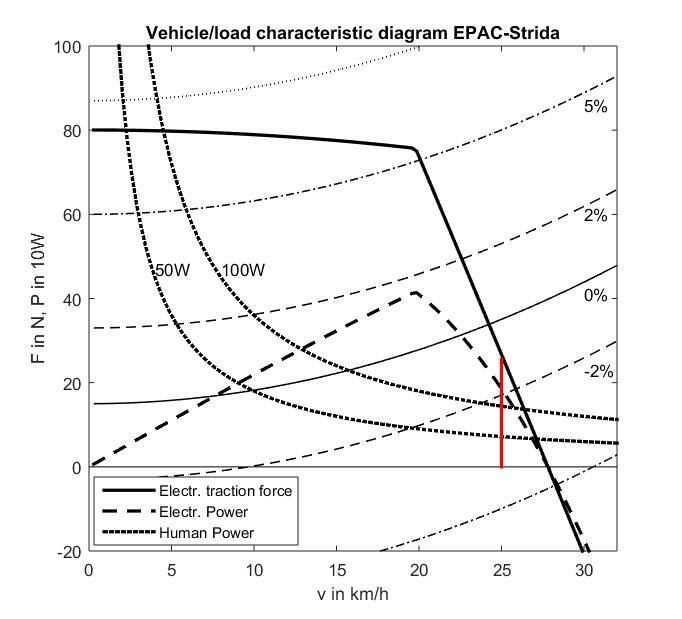 EPAC-Strida test cycle for one battery charge with human power requirement. The 6 EPAC-Strida prototypes had been tested in different commuting cycles in the Stuttgart metropolitan area by dozends of probands from autumn 2014 to summer 2017. While the afoot-train/tramway alternative requires significantly more time than the passenger car alternative, the EPAC-train/tramway alternative reaches comparable transfer times (including useful reading time in the range of 20-30 minutes). Based on 40-60 days/year with adequate weather conditions (a very conservative estimation) a typical commuter can shift about 5000 car-km’s per year towards the public transport system. A student marketing study  turned out that the add-on kit would double the price for the Strida-Bike. Nevertheless the expected target price of about 1200 € is in the range of cheaper E-Bikes. Slow foldable E-ULV have proven to be a key element for future sustainable public traffic chains. The electrification can be realized by a light and unexpensive add-on kit that can be adapted for several folding scooters and folding bicycles. The E-ULV have a significant potential to shift half of the car-kilometers today to the public transport in future. This has been proved by our fleet test in 2016 and 2017. The main obstacle for a legal applicable electric “last mile scooter” is the missing vehicle category on public walkways or the permission as “tolerated toys”. In the nearer future, ultralight electrified folding bikes represent the missing key element for sustainable traffic chains. This contribution had been worked out in the applied research project “Nachhaltig Mobil – TrottiElec”, funded by the Ministry of Traffic and Infrastructure Baden-Württemberg, Stuttgart. The authors thank for the support of TÜV SÜD in Munich/Pforzheim and the support of the industrial Partner Hudora GmbH, Remscheid. O. Zirn, O. Strobel, A. Norkauer, “TrottiElec – ultraleichter E-Kickroller für geschlossene Wegeketten im urbanen Verkehr,” AALE 2014, OTH Regensburg, 2014.